TL; DR: When Ryan Gray returned to the hosting industry in 2014 after a business detour, he found that many companies offered overpriced packages with bare-bones customer service. So he developed NameHero, a hosting provider that differentiates itself by delivering robust solutions, high performance, reliable infrastructure, and responsive customer support. Today, NameHero maintains a culture that values customers over profits — a dynamic that is evident in the services it provides. Ryan Gray started his first hosting company in 1998 but sold it in 2005 to shift his focus to other internet ventures. In 2014, he was operating an internet marketing forum for those who wanted to learn about internet advertising. It wasn’t until then that he realized the full scope of what a hosting provider could accomplish. Ryan didn’t just coach people through his marketing forum; he also made product recommendations. His forum showcased companies that provided solutions internet marketers needed — including web hosting. “That became very frustrating because I couldn’t find a web host that was good enough to recommend,” Ryan said. So he talked to his customers, trying to find people who liked their hosting providers. The feedback he received was even more troubling. Ryan Gray returned to the hosting industry in 2014 when he founded NameHero. “They all told me that their providers weren’t giving them enough support. At the time, companies were getting rid of support tickets in favor of online chat,” he said. That prompted Ryan to decide to return to the industry and provide people with the hosting solutions they needed — and deserved. In late 2014, he left his other ventures to found NameHero. He self-funded the company and began to stake out his own position in the market by offering speed, security, reliability, and responsive support. From the beginning, NameHero has provided its customers a phone number they could call anytime and has also offered 24/7 live chat. Its ticket desk responds within 15 minutes and resolves most cases within 45 minutes. That simple strategy — to be more available and responsive than the competition — has worked well for both NameHero and its customers. “Since 2015, we’ve had a tremendous amount of growth. Customers want a refreshing experience with great service, high reliability, and redundancy. That’s what we offer,” Ryan said. 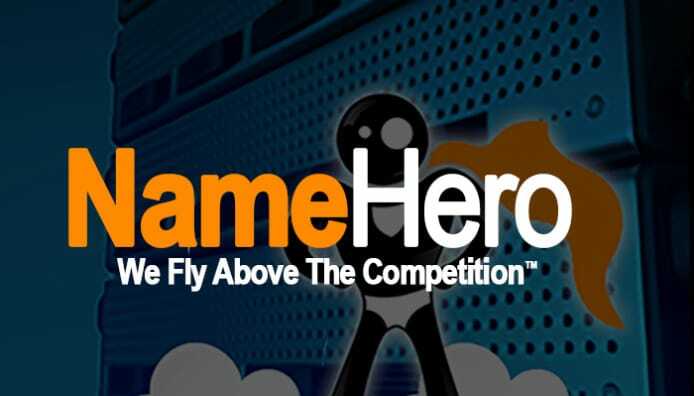 Initially, NameHero targeted resellers because Ryan said he believed that the market was neglected by the hosting industry. But selling to resellers wasn’t the reason he had built the company. He wanted to solve the problems he had heard from his marketing forum visitors. Many hosting companies advertised low starting price points, but their basic solutions often didn’t include many of the critical services customers needed. Instead, they were forced to buy features as expensive add-ons. Unlike those companies, NameHero doesn’t make users pick necessary services à la carte. “Our hosting packages include all the features our customers need. When they sign up, they don’t just get great infrastructure and support, they also avoid being upsold and cross-sold,” Ryan said. NameHero began offering free SSL certificates in 2016, and that has been one of the host’s standard features since 2017. If a site doesn’t have an SSL certificate, a web browser will show a warning that says, “Not Secure.” That warning is sure to scare away potential visitors, which is why NameHero wants to ensure all its customers’ sites are safe. NameHero offers customers free SSL certificates and seamlessly integrates with more than 450 applications. Another standard feature is the Litespeed Web Server, which is up to 10 times faster than Apache and is a drop-in replacement that can be added without making any changes to websites. Most hosting companies charge a premium for Litespeed, Ryan said. Most NameHero packages include Cloudflare with Railgun, a global content delivery network that helps websites load quickly while also providing security features. And the architecture on which all of these features run is sound. “We have proven 99.9% uptime, so we rarely have an outage. That’s because of the infrastructure that we built in the cloud,” Ryan said. And all customers — even the smallest businesses — can rely on NameHero’s speed. And the fast speeds are the same for large websites as they are for smaller ones. According to Ryan, the key is the flexibility NameHero offers in its service packages. Since the company runs in the cloud, it can add resources on demand. That includes RAM, disk space, or even processing power without taking a server offline to add hardware. If a customer’s small website sees a spike in traffic, NameHero can quickly scale it up, so the customer doesn’t encounter any lapses in availability. The host even has plans that work for clients with atypical growth patterns. When Ryan decided to return to his hosting roots by founding NameHero in 2014, he wanted to succeed by offering more. So he used customer feedback to create a more responsive company and infrastructure. And Ryan has learned from his competitors’ mistakes. He said many members of his team came from organizations where CEOs had lost touch with the company’s mission. Those executives focused on revenue generation, but, for NameHero, success is about customer satisfaction, offering exceptional services, and ensuring that employees love their jobs. That’s why Ryan keeps his ear to the ground. It’s a simple but profound idea, and NameHero employees pass that Golden Rule on to customers.